There's nothing better than making an otherwise slightly boring outfit more interesting with a statement necklace - and bag in this case! I don't get to wear this necklace half as much as I'd like to but I think that makes it more of statement when I do. It's very big and heavy, as you can see, so I tend to pair it with plainer, monochrome outfits and usually with shirts but I actually quite like how it looks with a more casual slubby tee. 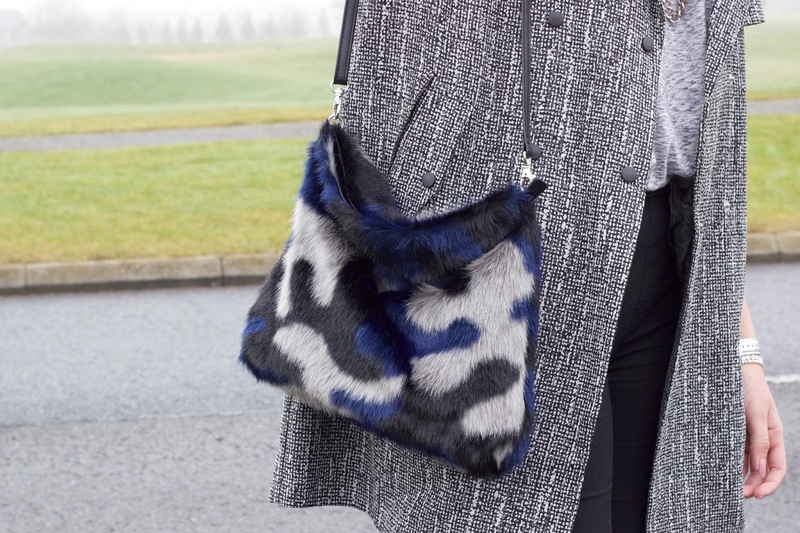 Another statement piece in this outfit is this Monki camo faux-fur bag that a picked up a few weeks ago in the ASOS sale. I like how it can be both a shoulder bag and a clutch depending on the occasion and it adds a slight bit of subtle colour to a monochrome look like this one. It does fit quite a lot in it too, I've been using it this week for work and it carries all of my daily essentials perfectly. I also want to address that, I know I'm wearing these patent loafers to death but I just love how they go with almost everything and make an outfit looking smarter than it would with say converse, which would be my other footwear choice for this outfit. I promise that they wont appear in any more outfits for a few weeks!